Play memory and learn solid and plane shapes at the same time! Match the solid or plane shape with a real life item that is the same shape. The player with the most matches wins! This pack includes 12 different shape name and corresponding figure cards for your students to create and play a shape memory game in English or Spanish. Are you looking for a low prep supplement to your geometry unit? 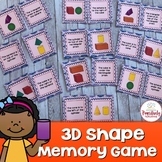 3D Shape Memory Game is a great hands-on geometry activity and this unit is the perfect supplement to any geometry unit. This activity works great for centers, small group instruction, reteaching, on-going practice and so much more! Using 3D Shapes (real life examples included) for student identification. Teacher will need to copy and cut out pieces. Use this game to practice shapes with your students. Would be perfect for a math canter or as an independent math game! Just cut apart, mount, and laminate. Goes with unit 3 of the first grade common core. 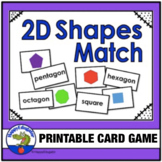 This 2D shapes game includes both real world examples and traditional shapes to make matching them up fun for all! 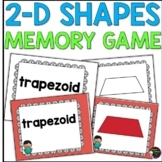 I made this memory game for my kiddos to use in math stations to practice their 2D shapes. Enjoy! Graphics from Love Two Teach. 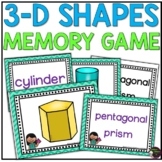 This memory game can be used to review two dimensional shapes. Shapes included: -circle -trapezoid -rectangle -octagon -triangle -square -hexagon -pentagon -rhombus This memory game is also available in black and white upon request. 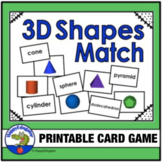 This is a matching game focusing on colors and shapes. Students will match a colored shape to the shape word. This is a very standard memory matching game.